E.L. BLEIBERG, « Historical Texts as Political Propaganda during the New Kingdom », BES 7, 1986, p. 5-14 1 citation(s).  E.L. BLEIBERG, « Commodity Exchange in the Annals of Thutmose III », JSSEA 11/2, 1981, p. 107-110 2 citation(s). 4 986 547 visites - 2 064 visite(s) aujourd’hui - 2 connecte(s).